Something's cooking! Our spring picks for Trove are seasoned with form and function, the ideal accessories for a chef's kitchen. MUSHROOM POWERED Herbal Revolution provides high-quality herbal teas, tonics and elixirs, all hand-crafted in small batches. 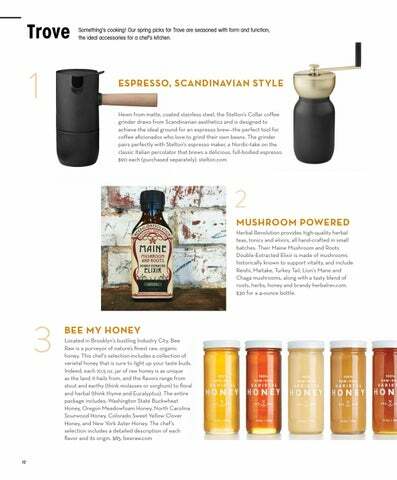 Their Maine Mushroom and Roots Double-Extracted Elixir is made of mushrooms historically known to support vitality, and include Reishi, Maitake, Turkey Tail, Lion's Mane and Chaga mushrooms, along with a tasty blend of roots, herbs, honey and brandy herbalrev.com. $30 for a 4-ounce bottle.